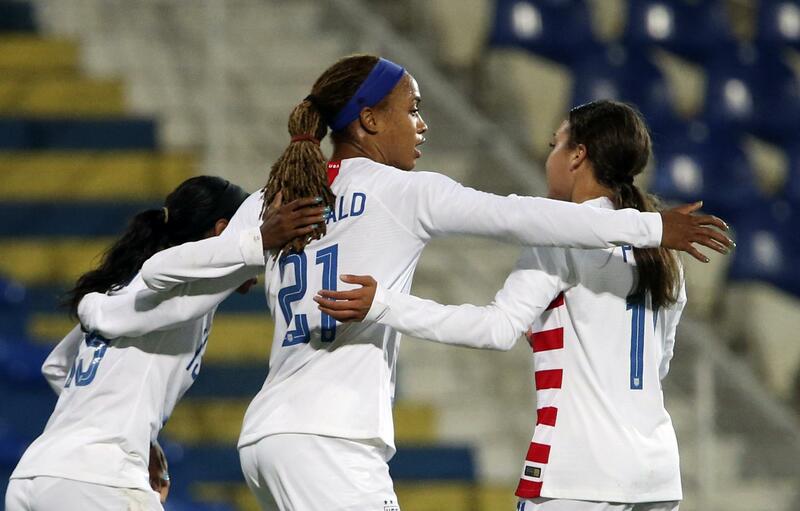 Thu., Nov. 8, 2018, 12:38 p.m.
Jessica McDonald, making just her second appearance for the national team, scored in the 43rd minute and the U.S. women’s national team reached its 500th victory with a 1-0 win over Portugal in Lisbon. The U.S. national team is now 500-65-74 overall since its inception in 1985. With the victory, the Americans remain undefeated this year at 17 wins and two ties. The team has an unbeaten streak of 27 games (24 wins, three ties) dating to a 1-0 loss to Australia in the Tournament of Nations. The streak comes as the U.S. team prepares for the World Cup next year in France. The defending World Cup champions qualified for the tournament last month at the CONCACAF women’s championship. The United States is currently the top-ranked team in the world, while Portugal is ranked No. 33 and did not qualify for France. McDonald, 30, who plays for the North Carolina Courage of the National Women’s Soccer League, started for the United States. Her rebound goal was her first for the national team. McDonald had a pair of goals for the Courage in a 3-0 victory over the Portland Thorns for the NWSL championship this season and she was named that game’s Most Valuable Player. Midfielder Danielle Colaprico, who plays for the NWSL’s Chicago Red Stars, made her first appearance for the national team as a sub in the second half. University of North Carolina sophomore defender Emily Fox started in her first appearance with the team. The U.S. team was without Christen Press and Tobin Heath because of personal commitments. The United States plays Scotland on Tuesday to wrap up a two-match European trip before taking the rest of the year off. Published: Nov. 8, 2018, 12:38 p.m.